And all you can see was insanity and craziness in the Walter Van Beirendoncks Spring/Summer 2019 Paris. And then you can turn it around and see this zig-zag catwalk, and you can see this green ducks pattern on every trouser, shirt, jackets and not only that. You can find as well, this green donkey face in a jacket and a rain coat, made by the designer. Vital to stay alive in the fashion scene, we really thank to Van Beirendonck to be a survival and he always give us surprises and laughs. We have to mention that, he made this stunning clogs shoes in marvelous brilliant shoes, mixed it up with applications in the hats, also this structural skeletons square jackets. 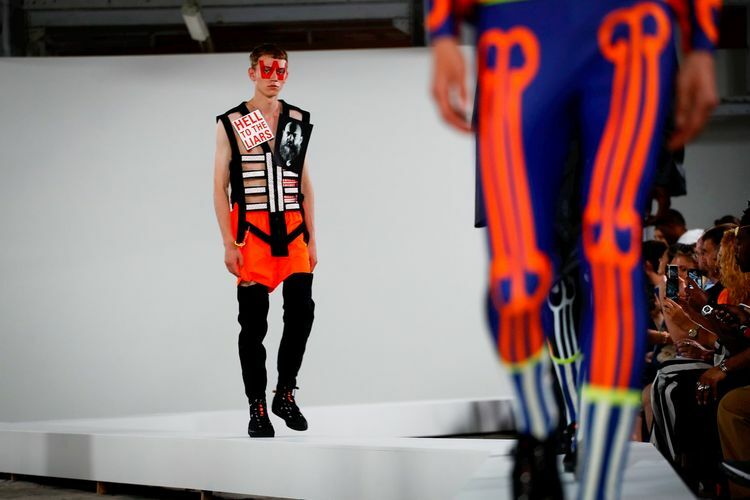 You can see more highlights of Walter van Beirendonck @waltervanbeirendonckofficial.